Bamboo can be processing into multiple sizes according to the customers’ requirements.other wood usually have fixed dimensions. For wood plastic , you should adding cost because of opening moulds. 02: Bamboo has higher strength , it can save cost in the same circumstances. 5 times than plastic wood. For an example, selecting wood when installing flooring, we need a 45mm thick wood, a 20mm thick bamboo is enough for our need. However, the strength of bamboo is far exceeds that of 45mm thick anti-corrsion wood and 45mm thick plastic wood. In other words, when choosing wood as flooring, we need 1 cubic meter, but 0.5 cubic meter bamboo is enough, saving materials and cost. 03: Superior stability of bamboo. Antiseptic wood is directly processed by wood, though the moisture content can be controlled in multiple stages of productions, when encountering damp and dry changes of weather, the coefficient of expansion will be bigger. 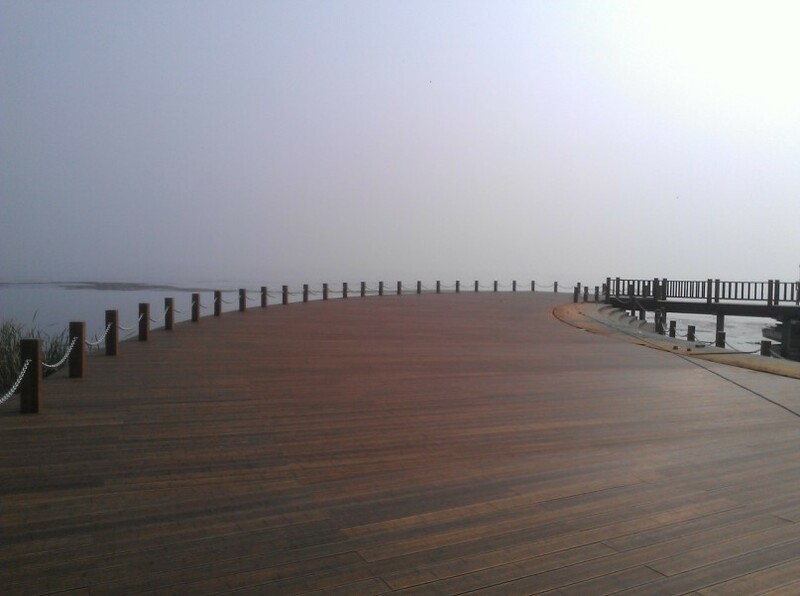 Therefore, antiseptic wood has low performance in stability and water proofing. In a test, which is 72hours boiling water-absorbing expansivity, known as the devil test, facing the excellent Europe Standard of 20%, the test result of bamboo is as low as 8.8%. Meanwhile, water-absorbing expansivity can be controllable for bamboo , so your worry about warp and cracking can disappear from this time on. 04: Long life span of bamboo ,superior anticorrosion performance, usually 5-10 times comparing to common wood. Bamboo is waterproof and dampproof.It radically solves the perishable and expansion problems of wood article s’water-absorbing in moist and waterish environment, bamboo can be used for environment where wood products can not be applied. Insects and termites prevention, effectively stopping the insects harass, extending the life span. In the anti-aging test f-or 30years outdoor application,strength can be kept more than 50%. The useful life of anticorrosion wood and plastic wood is about 3 years, bamboo products needs to be make one maintenance one year if you want to change your products, the life span of bamboo products can reach more than 10 years. Within 10 years, other materials need to be replaced 2-3 times,but lower maintenance cost for bamboo. In the long run, the maintenance cost of bamboo is far below other outdoor materials. The Bamboo has passed the combustion performance test of The National Quality Supervision and Inspection Center of fixed fire extinguishing systems and fire-resistant components, the combustion performance reaches the grade of C-S1,D0t1, fits the national A-grade standards. Please see details for test report. Bamboo-obtaining is environmental, there is no any damage to ecological environment, which a zero-carbon industry. The formaldehyde emission is as low as 0.2mg/100g during the manufacturing process, this emission is far below the 0.5mg/100g of Europe indoor E1 standard, and outdoor ecology is synchronous to the indoor standard from this time on. The density of Bamboo can reach more than 1.2g/cm3, but the density of pinus sylvestris which is used widely as anti-corrosion wood only reaches 0.4g/cm3. The density of high-class pineapple grid only can reach 1.0g/cm3. The density of plastic wood reaches 1.3g/cm3. 09: Easy to install, convenient to construct, no need of complicated construction technique, saving time and cost of installation.